The month of October flew by this year, and all of the weekends seemed to be spoken for by Florida State football games. Lots of home games this October. 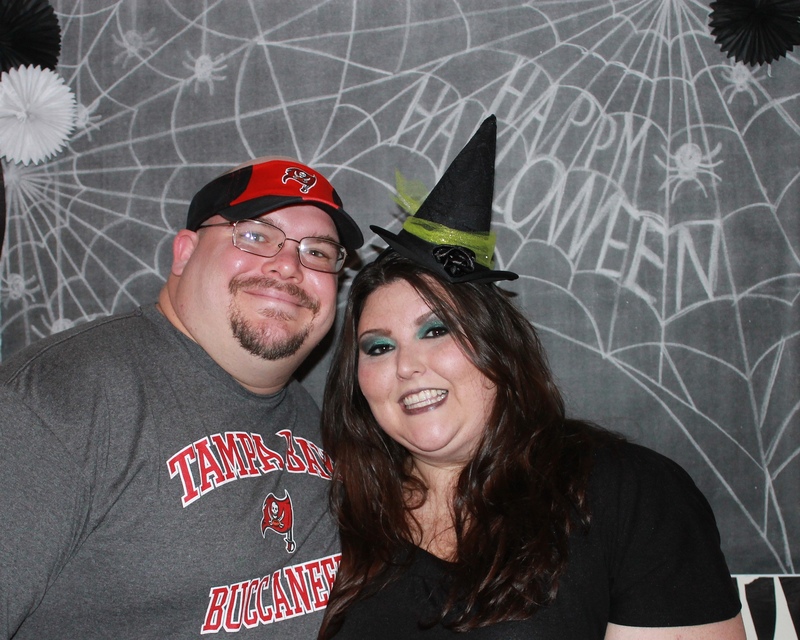 That and Halloween was on a Thursday this year…so Julia and I decided that our Halloween party should be a little low key this year, especially since we were scheduling it on a Friday night before an FSU home game. 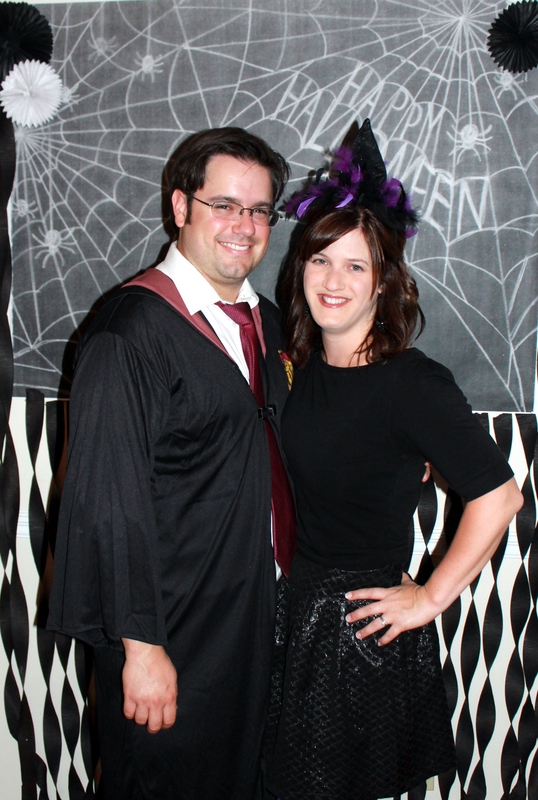 So we decided to go with a dinner party this year, with a subtle witches and wizards theme. 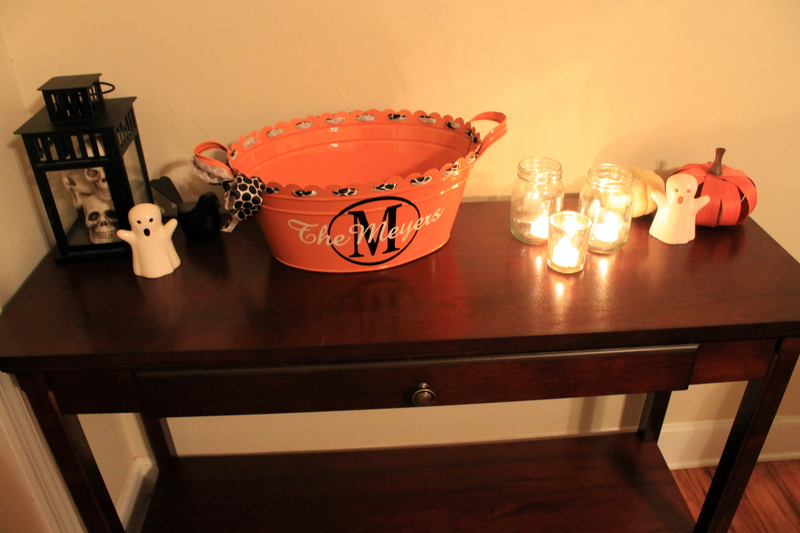 Decorating was easy this year, since we spent so much time last year collecting lots of Halloween items. We decided that we should make ahead the items for dinner, so we went with a vegetable lasagna (Julia) and a baked ziti with meat sauce (me) stuff that would be easy to heat up, along with salad and bread of course. 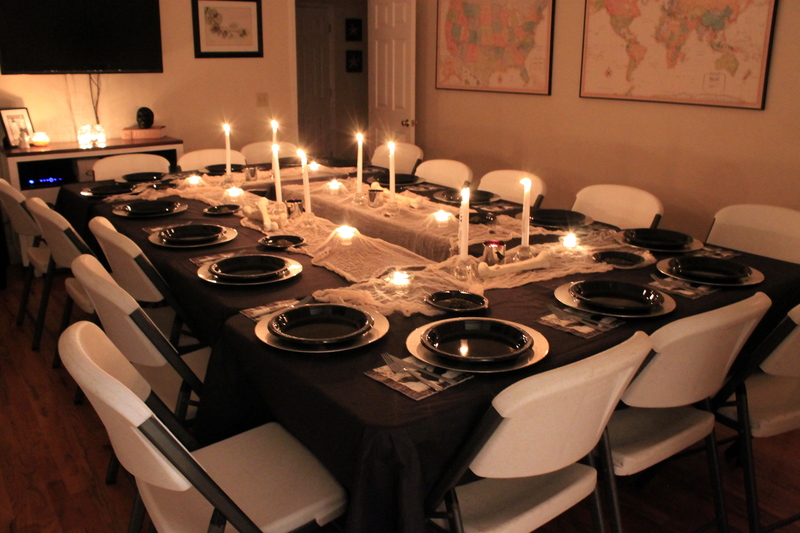 We rented tables and chairs so we could all sit together, and boarded the dogs so that we could light candles unafraid of them getting knocked over and setting fire. And four hours before the party we looked at each other and said, ” Can it really be? 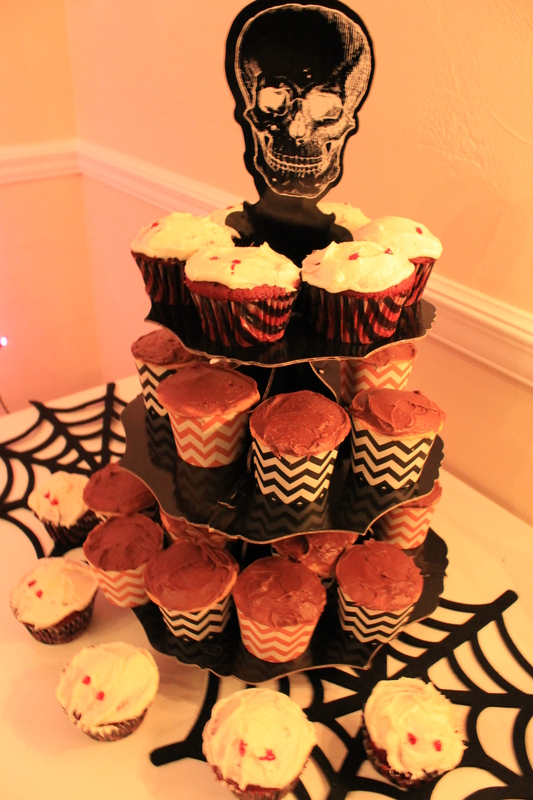 Can we really be done with setting up this early?” Famous last words….haha. 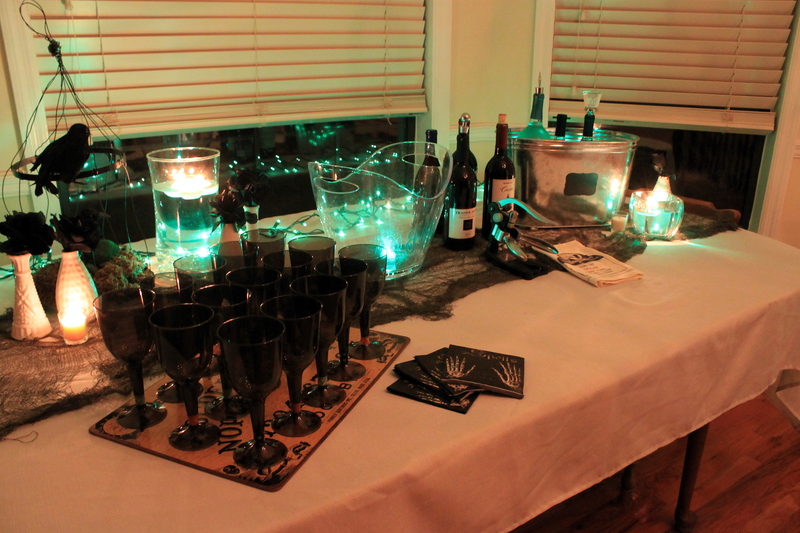 Yes we were done with the set up and decoration…we prepared as well as we could have and had time to get ready and have a glass of wine before the guests even arrived! 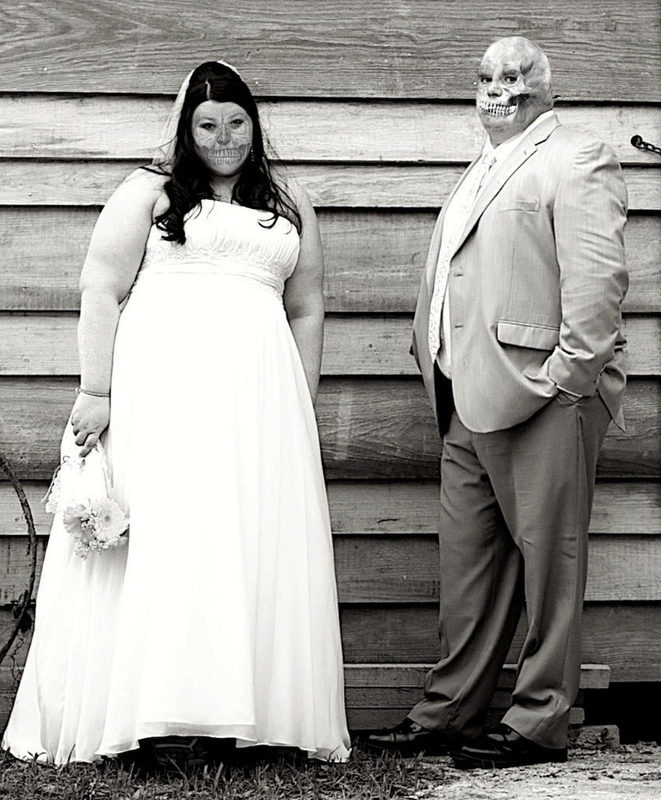 It was a dream…and felt too good to be true….it was. For some doom was to come upon us later in the night. 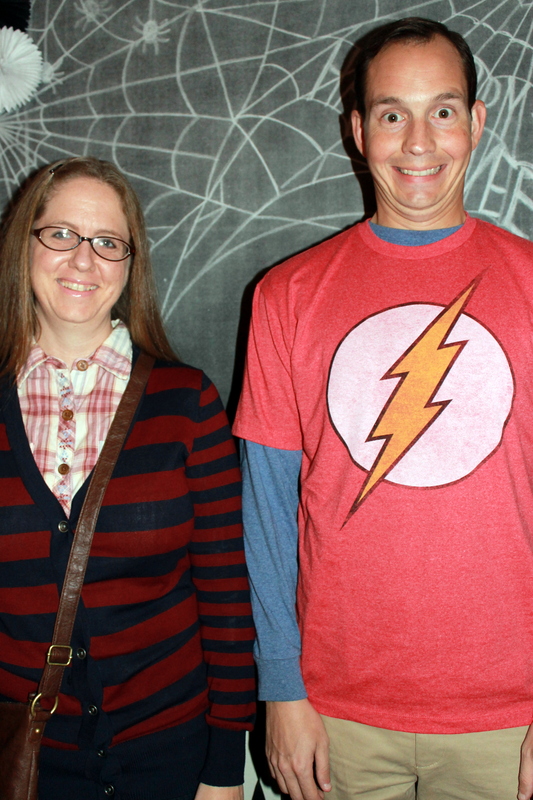 We used a backdrop this year, for a photobooth type of photo. I’m pretty happy with this addition, I think it’ll be a keeper. 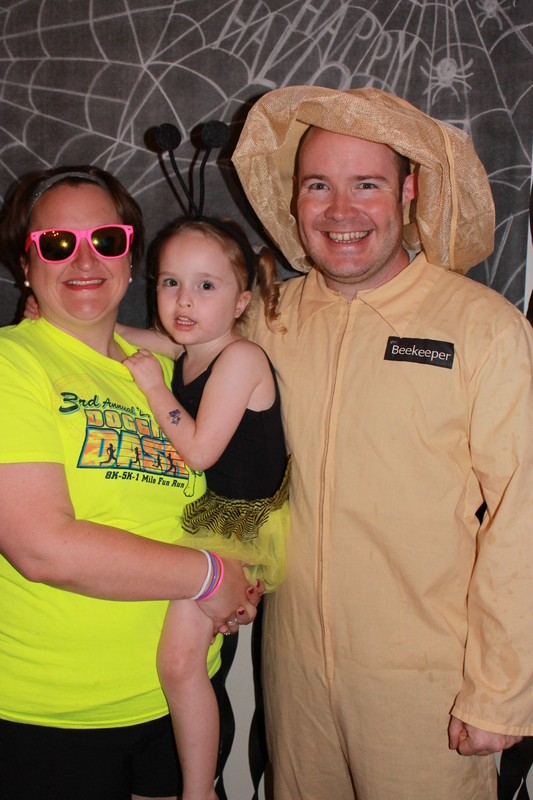 I think I got everyone but Jaime and Shiloh, which is sad because they had AMAZING costumes this year! 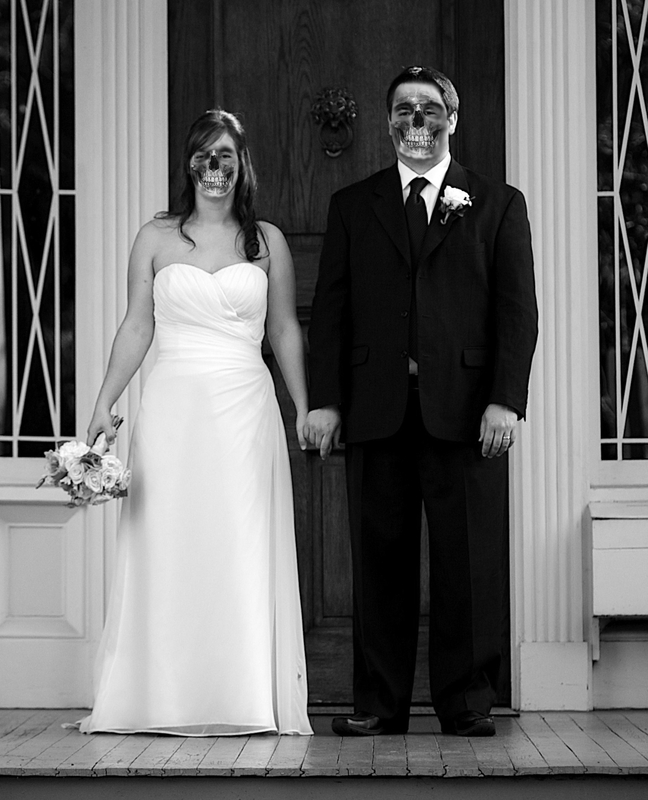 They were voodoo queen and voodoo doll. Loved it, especially because we’re waay into American Horror Story this year!! Well my friends, let this be a lesson to all of us that you should not play with fire…because while we were all gathered in the kitchen, preparing to make our plates and sit down to dinner…a shrill scream blasted through the air…the fire alarm. We ran into the living room and all of the tables were ON FIRE! 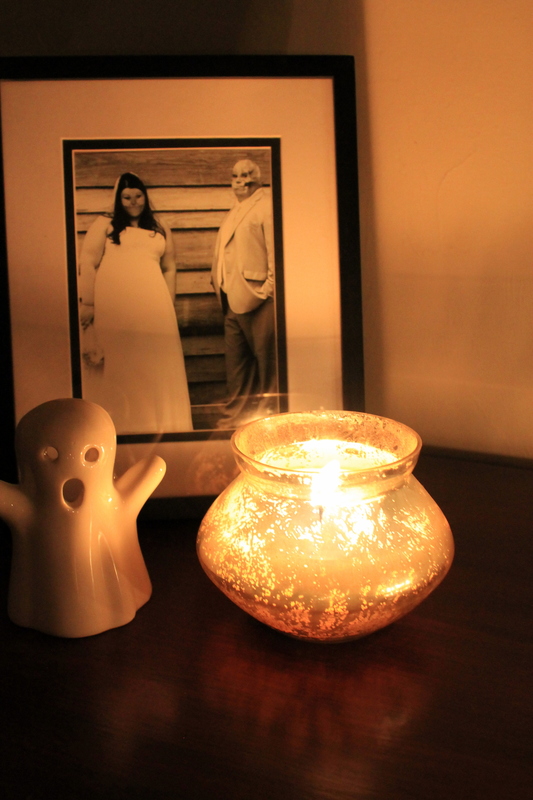 It was the scariest thing ever to see our living room in a blaze. Joey ran in and fearlessly began batting at the flames, and everyone kind of froze for a minute watching before we all kicked it in gear and started filling up cups of water to throw on the flames. Wasn’t really the best idea…all that really accomplished was a giant mess of an aftermath, but in the end, the flames were all extinguished, and we were all ok.
We were so very lucky though that no one was hurt, and that the house was ok. The tables suffered a bit of a scorching, but they all still work fine (although we’re still waiting for that bill from the party rental company-thank goodness I’m friends with the owner lol). Nothing or anyone was harmed other than the tables, a couple of the rental chairs, and unfortunately our floors suffered a scorch mark or two, or three…haha. But nothing that can’t be buffed out and refinished later on down the road when we care enough/don’t have doggies and babies doing their own damage to them. So probably whenever we go to sell…haha. All in all, our ego suffered the most damage, but we’re recovering and hoping that one day it will be a funny story. In the meantime I’m trying to embrace the imperfections in the floors like everything else in our home… chalking it up to memories and reminders of how blessed we are everyday to be safe, healthy and have a beautiful roof over our heads. 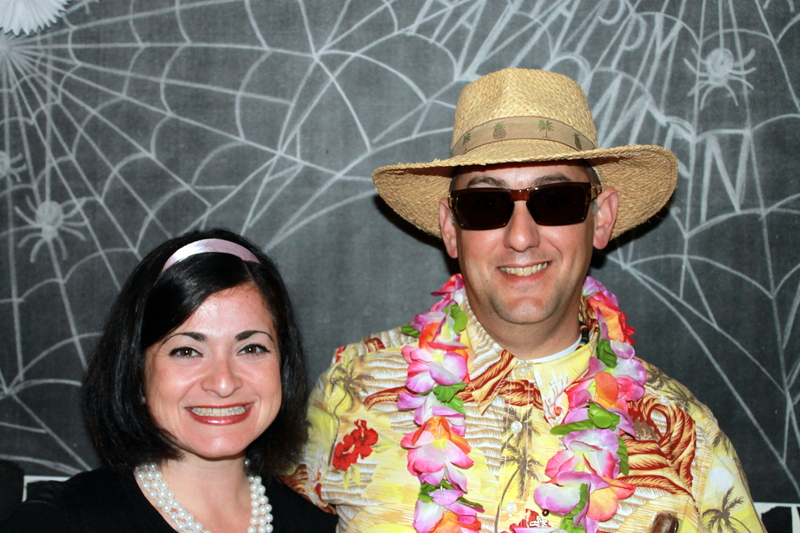 Typically, my friends Dan and Celeste host a Halloween party every year, it’s always a good time, and a great excuse to get together with friends and get costumed up! 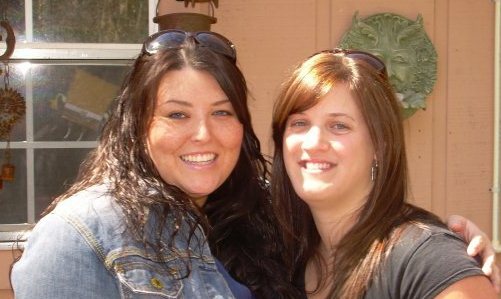 Sadly, this year, Dan and Celeste moved away and we were left without a party host. 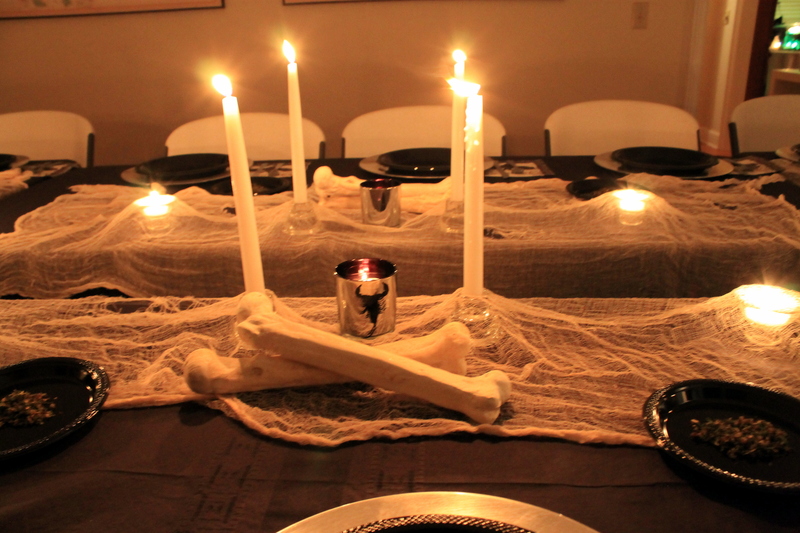 So, my best friend Julia and I cooked up this plan to host a Halloween party at the Meyer Manor. 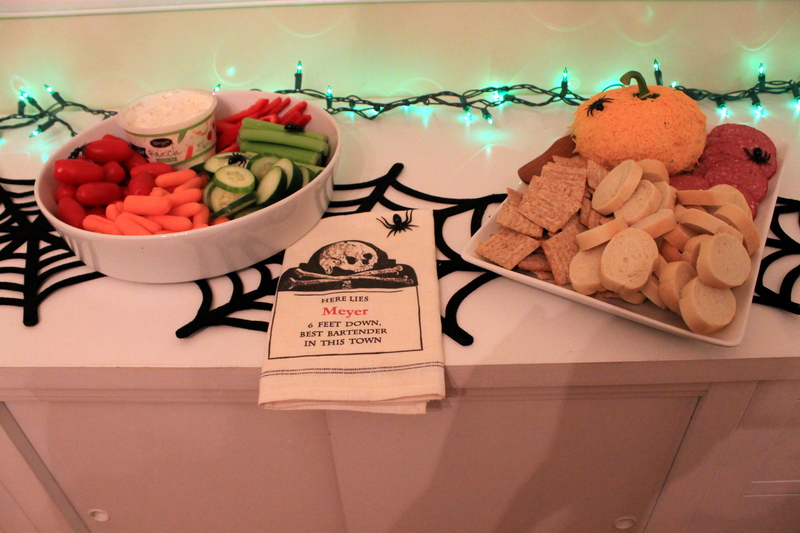 Julia and I should really start a side business in party planning. We love it so much, and tend to be of the same mindset when it comes to that sort of stuff. Maybe one day one of us will win the lottery and we can actually start that venture. 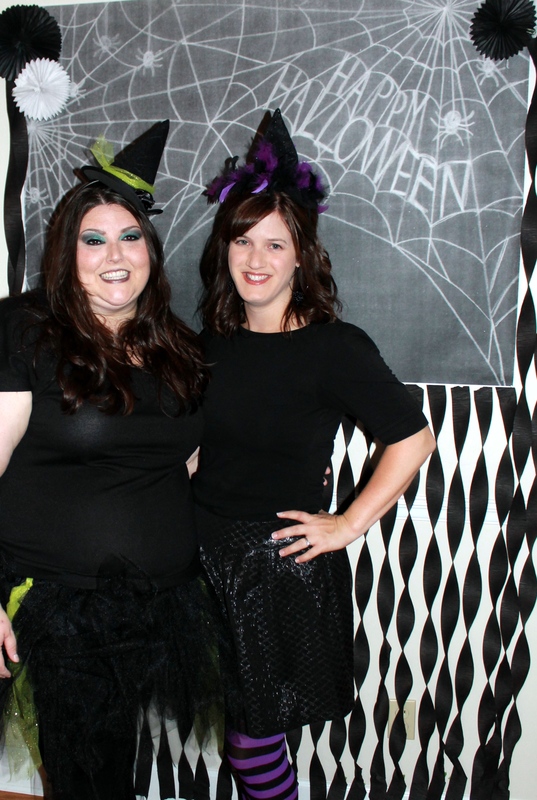 This party was no different, we had a ball shopping for supplies and decorating. We legitimately started planning in August. This year it was a bit of work because we weren’t fully moved in….we still had a lot of things displaced (a TON of wedding stuff) and the craft room and dining room were ground zero for all this stuff. So it took a lot of effort to get the dining room into shape for the party, I gave up on the craft room and covered it with a plastic tarp Dexter-style. 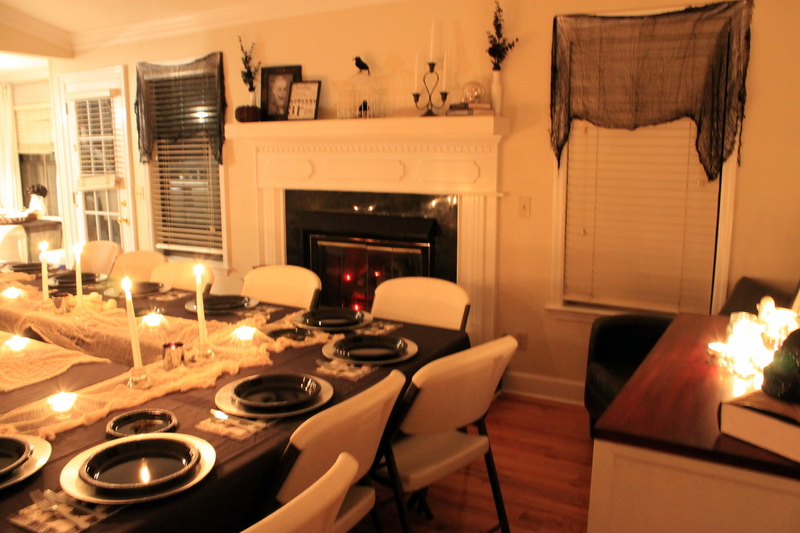 But the rest of the house came together pretty nicely, and although we didn’t get to do all the details we wanted to do, we look forward to next year’s party. And maybe next year I’ll actually finish my costume. Or get smart and just buy one like a normal person. 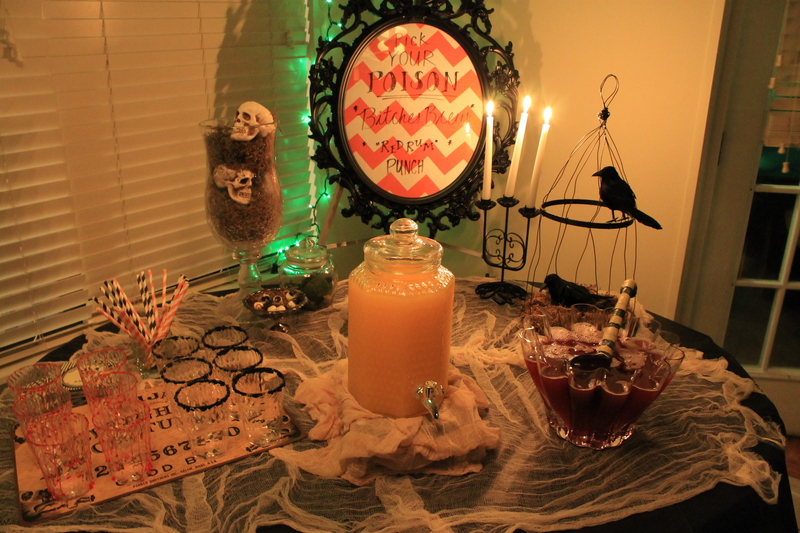 There were a few different tablescapes going on that night but I think the drink table was my favorite. The candelabra was a $5 find from Goodwill that we spray painted ORB, we actually picked up two from GW but I don’t think I took a picture of the other one. You can barely see it in the photo, but there is a little silver stand that is covered in eyeballs. I found them at Target, and they were delightfully disgusting, they were sticky! 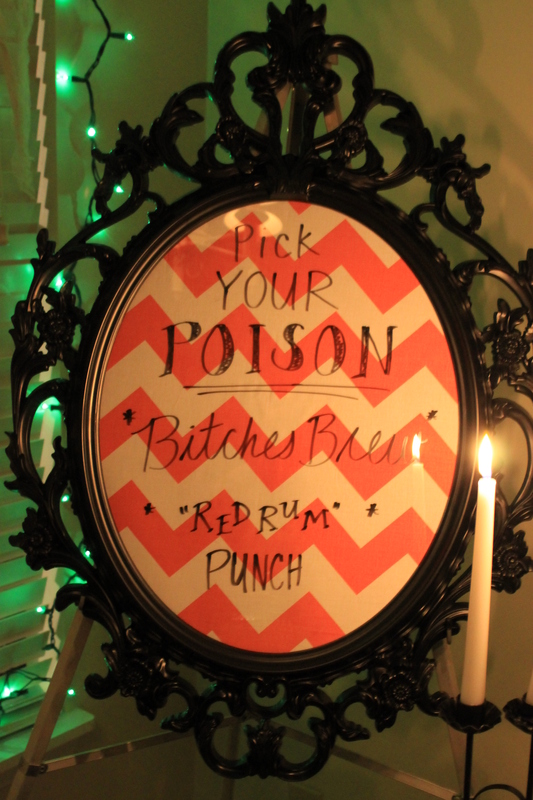 The bar menu was a large frame from Ikea that we inserted some orange chevron fabric into and used as a dry erase board. 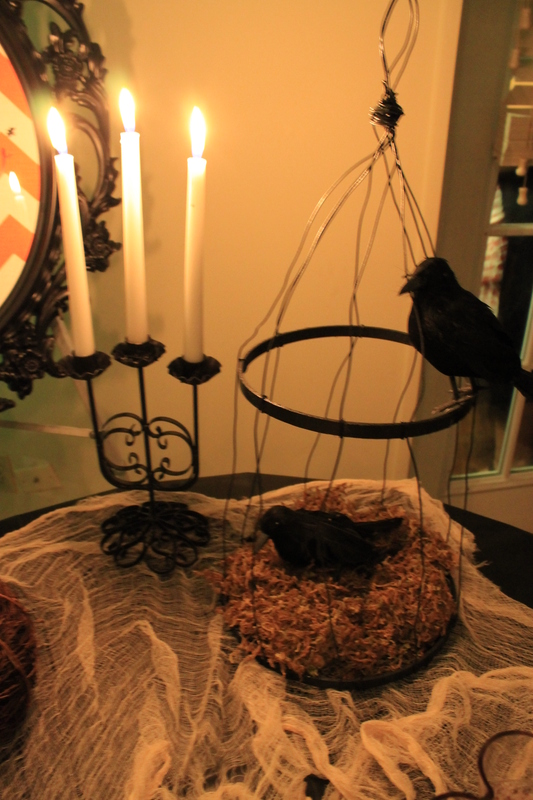 Julia made this bird-cage, and I really can’t stop gushing about it. 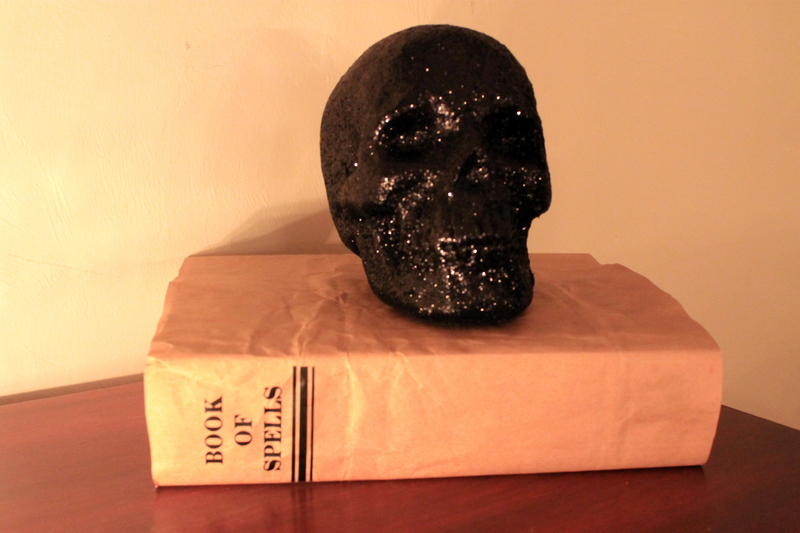 I hope that it survives storage so we can use it again for future Halloweens. There is just something so creepy about it!! She also tea stained the cheese cloth, which we used not only on this table, but also as curtains in the kitchen and living room. One of those things you can’t really tell from the photos, but was a really cool detail in person. 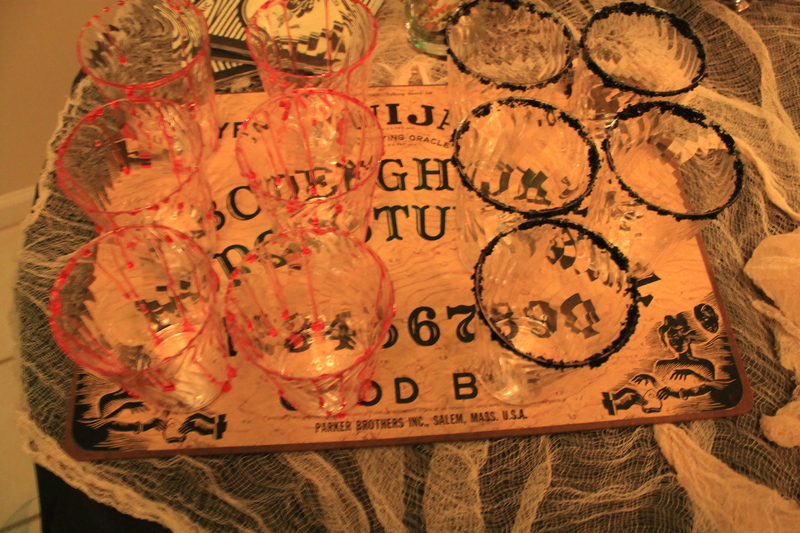 We used my grandmother’s old Ouija Board as a serving tray, and I love that detail too. 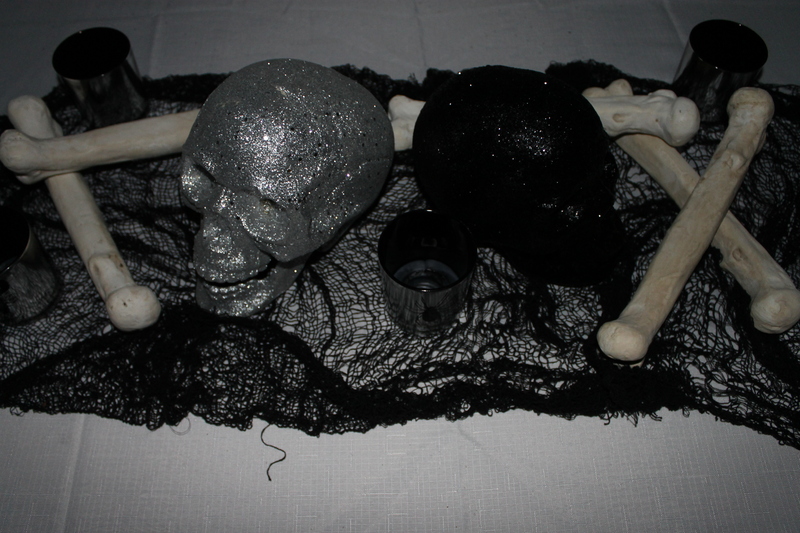 Joey actually banned it from the house, it was only allowed the night of the party and I had to promise to hide the planchette so we wouldn’t get into trouble. 🙂 It’s fair though, this particular Board actually works and is super creepy. So it was used a serving tray, and was pretty spectacular. I kind of want to actually convert it into a real tray, like add some wooden sides and a base to it, but I’m still thinking about it. I’m nostalgic about it because it was my grandmother’s, so I don’t want to rush into anything…but it might not be a bad idea to retire it from its intended purpose. 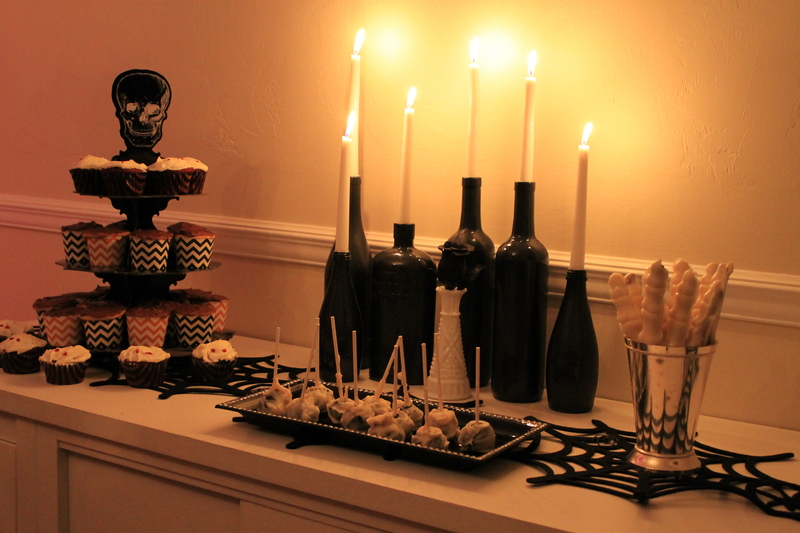 Onto the next tablescape…This is the food table which we set up in the dining room. Please forgive the lighting in these pictures, we dimmed all the lights we could and hung colored lights in places to up the creep factor. It worked in person, but looks kind of odd in photos. 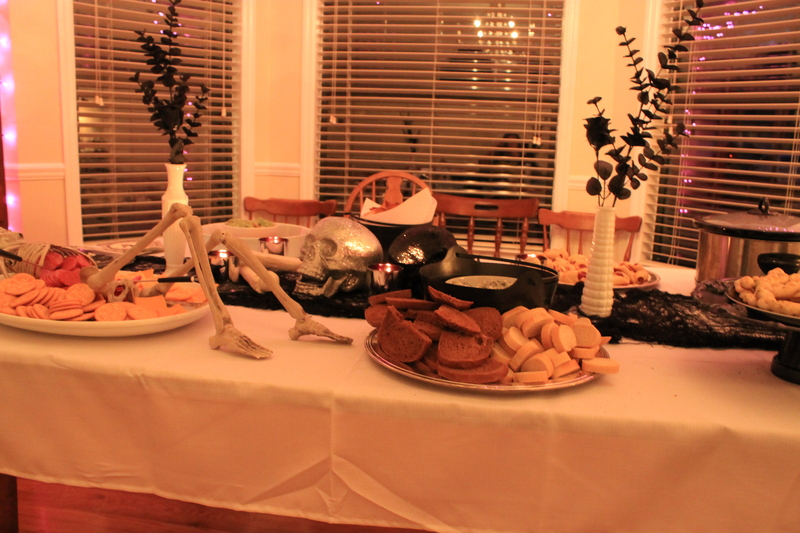 We played around with the food presentation and served a few things out of plastic cauldrons, and on platters that were labeled “Poison”. 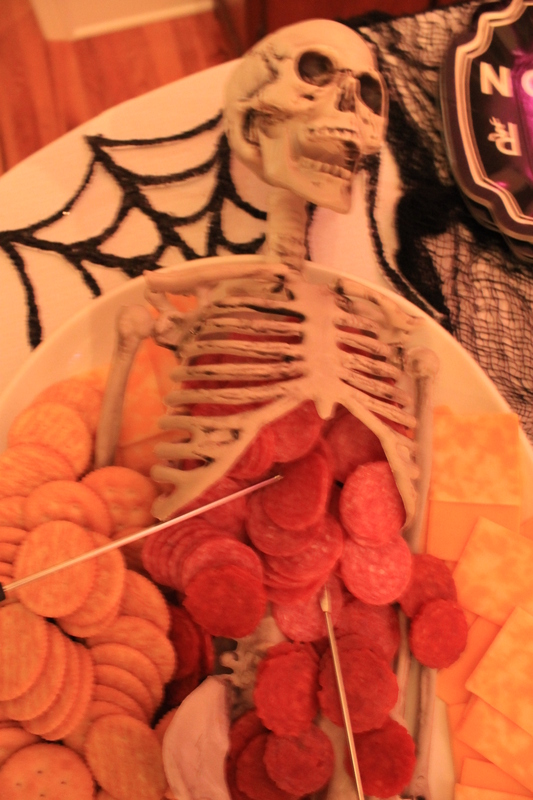 I got the idea of the skeleton meat and cheese tray from Pinterest, and it was a pretty big hit. 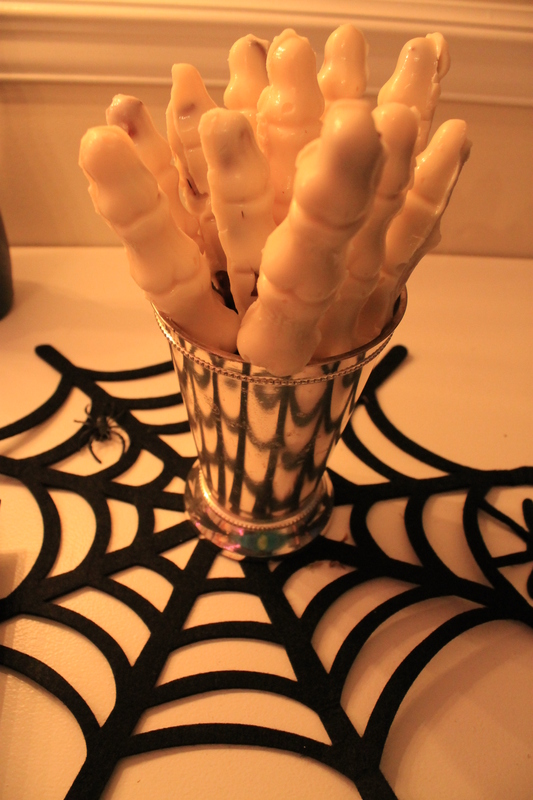 We used fondue skewers for added effect instead of tooth picks. 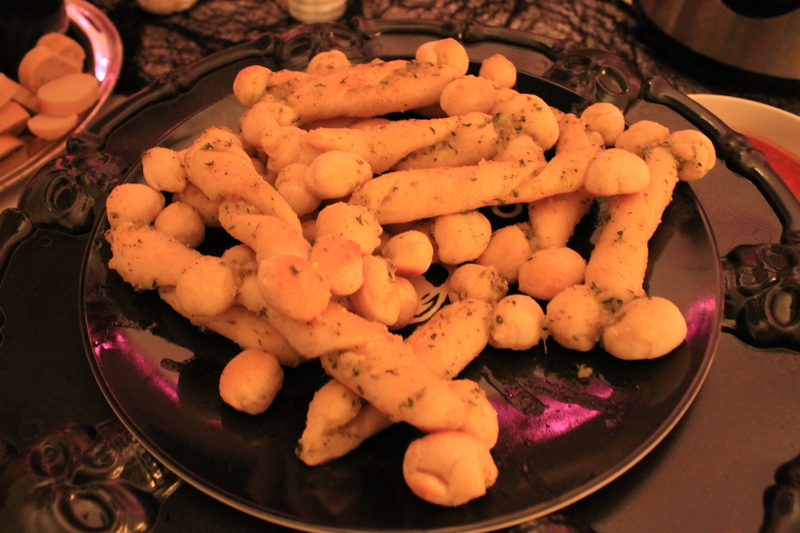 Matt made these delicious garlic breadstick bones, they were tedious, but sooo delicious! I really wish I’d taken photos of the bathroom…it was set up like a murder scene and was pretty epic. 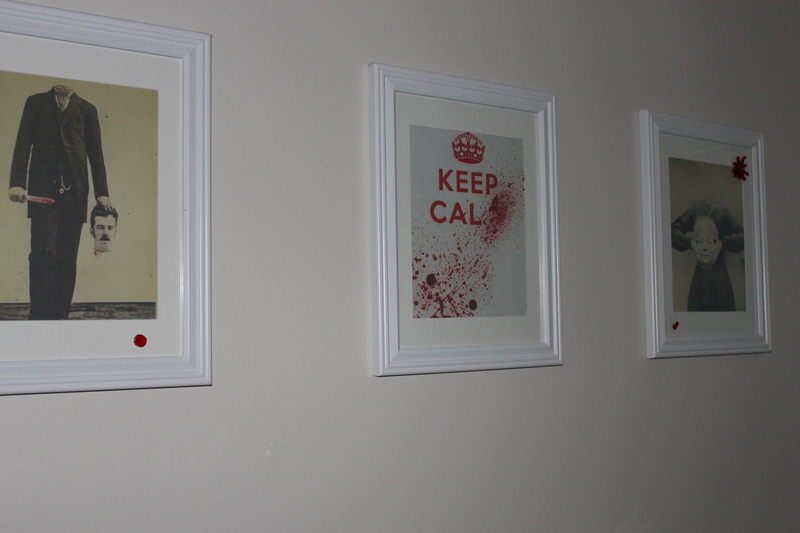 We attacked the mirror with gel blood splatter and hand prints, and smeared white towels with red blood hand prints. We also hung a blood stained shower curtain, and backlit the bathtub with red led lights. I’ll get pictures next year I promise. Another thing I wish we’d photographed was the explosion of spiders on the garage door. Julia had bought a Enter At Your Own Risk which we attached a magnetic strip to, as well as cut apart what felt like hundreds of those black spider rings to steal the spiders from them which we glued magnets to and also attached them to the door. It was creepy, and really stood out on the white door. 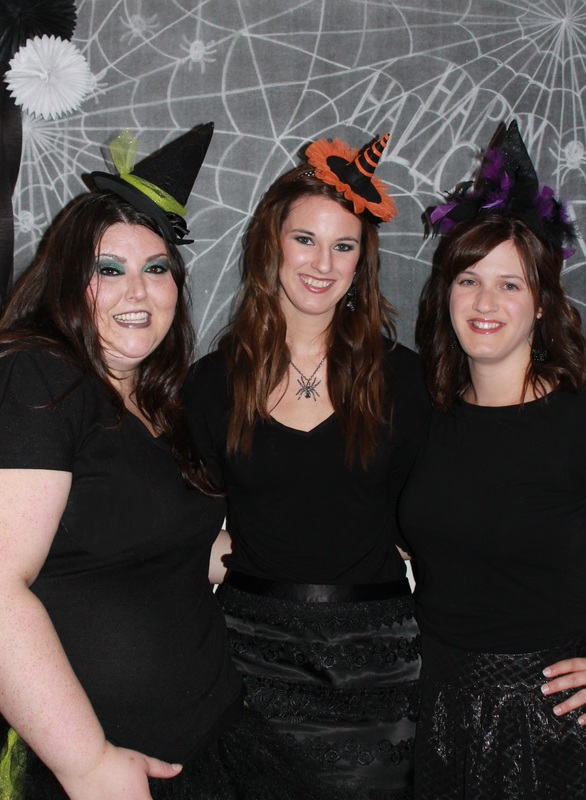 And that about wraps up Halloween 2012! I’m not going to upload pics of our costumes because I’m disappointed with myself and how I didn’t finish my own costume. 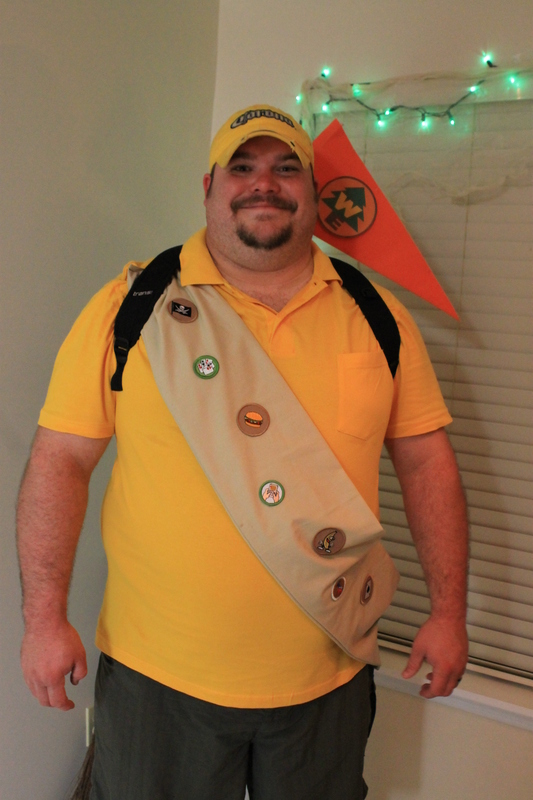 We went as characters from the movie UP, Joey was “Russell the boy scout”, Chief was “Doug the dog” and I was going to be “Kevin the bird” and it could have been awesome if I’d had more time. 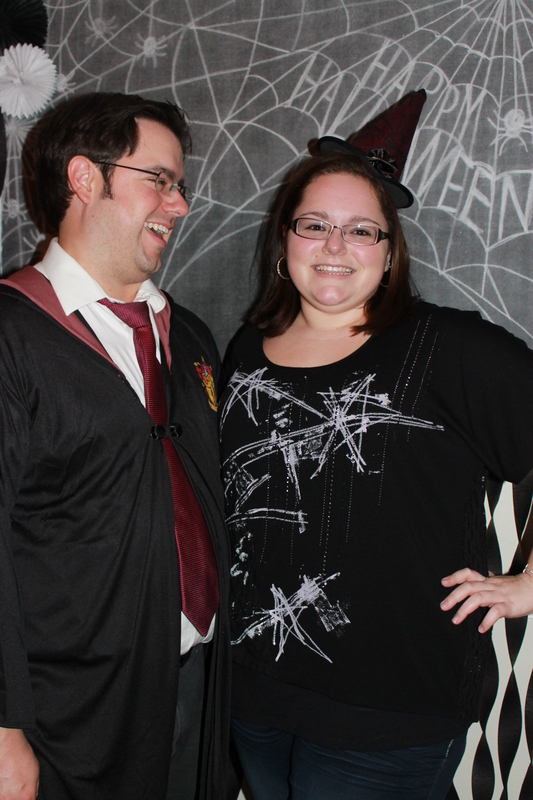 But I will leave you with Joey as Russell, because his costume turned out kind of adorable if you ask me. 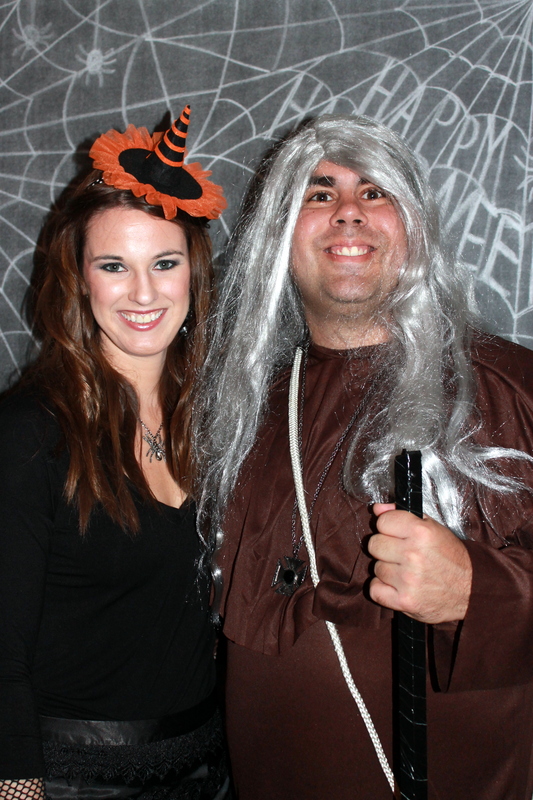 He’ll probably hate me for posting this…so forgive me if it disappears before you get a chance to see it… haha.